we sit on sunday mornings at the dining table with the fat sunday newspaper, steaming cups of tea and the morgenbrød that husband always goes and gets at the bakery. it was during one of these times that the whole blog camp idea was born. what we're reading always provokes discussion, this morning it was of trading schemes to offset CO2, how this government hasn't devoted enough money or attention to research into alternative fuel technology and on to how difficult it must be to write a feature story about someone who won't speak to the reporter. 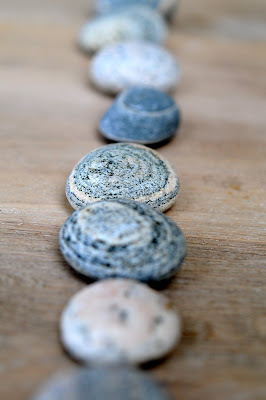 on the table were the stones i gathered on that beach in norway last week. husband was teasing me about bringing half of norway home in my suitcase and i was assuring him i'd left quite a lot of it behind. since he loves to dig, i said he should have more understanding for my need to commune with the rocks as he does with the soil in all that digging. i philosophized some lofty thoughts about how the stones put you back in touch with something ancient and basic and make you feel some kind of connection to a continuous line stretching through time. and i was only half-kidding, tho' i said it all off the top of my head. i told husband that it gives me a palpable sense of calm to find a stone that fits perfectly in my hand and hold it, feeling its coolness in my hand and transferring my own warmth to it (sabin just picked up this stone which i had been holding and it was still warm after lying on the table for half an hour). husband suggested that i start a new -ism. rockism. (we need to work on that name.) i'm aware that there are already theories like this involving crystals, but i'm much more drawn to simple stones. rockism would advocate the gathering and collecting of stones and of sitting around holding them in order to get in tuned into that line of continuity with the earth. because i swear that if the stone is right, you can feel the ur-energy humming and flowing into you through the stone. i think we're searching for centres of calm in this fast-paced life and that one way i find it is in my love of stones. that's my -ism and i'm sticking to it. i don't really think you need to know anything about rocks, i think you just have to like them. :-) it's quite addictive, let me tell you! A totally different angle to stones. Normally I only acknowledge them if they are in my shoes. But this kind of theorizing fits the whole choosing to be happy/silver linings crap i have going (not to mention corn). Perhaps I'll now look at the ones in my shoes as opportunities to commune with nature. Julie- I sometimes think you live in my head (which is why I so get those crazy siamese twins). Stones abound in my home and I use them in bodywork for grounding. I could write a whole post on my love of rocks starting at the age of eight. In fact, I think I will or risk writing a comment as long my arm. Stay tuned. are you aware that they are heated and used in some massage and relaxation treatments? I started my early love for all things glittery when I found stone with mica in them at my uncle's lake cabin. I do the same thing with random bottles that speak to me. Hi Julie.. the more I read your blog the more I realise there's so much more to appreciate out there that we often take for granted and we just stomp on rocks... we need to pick them up feel them and (this is my fave part), listen the noise them make when you throw them all down together or you jiggle some small ones in your hand. We have a good size collection at home, my kids are rockies too!!! I like stones too - something about the permanence; ability to survive chaos and catastrophe. When I was a little girl I was well known in my family for my quirky collection of rocks. I had a passion for them then and have even more now. I became what is known in Canada as a Rock Hound. Rock Hounders are collectors and amateur geologists who have learned about the history of rocks in the making and where to look for these rocks. Some are precious, some semi- precious and some precious only to the owner because it spoke to them. The colour, the shape or the feel. My house is full of rocks and you can feel the ancientness (new word) when holding them. lorac--i was accused of being a rock hound when i was a kid (so dak). and i love the word ancientness. i'm so gonna use that in the near future. you know, I once went to a work conference where a "consultant" (I think that was what her title was, not sure...) brought a pile of rocks and told us to hold one if we wanted to and tell what it said to us. the idea might be good but to try this in the midst of re-organization chaos with 50 or so angry and frustrated people was not very clever. I'm rambling :-) I love rocks and the way they hold warmth. julochka, all i can say is... you rock! (pun intended) seriously, i love, love rocks too. fragrant muse has already posted on the subject and i may well be inclined to do so myself later on today. Worlds within whorls on those stones. I love the thousand-year oak thing. Possibly one of those things that everyone would have an equivalent of, if this were the best of all possible worlds. I found a similar stone those days and forgot to take a picture of it, it fits into my hand perfectly and after a minute it feels warm and silky. as it deserves to be shown in a post I will do that tomorrow! thanks for reminding me! I've known more than a few stoners ... 'course, they got stoned for non ecological or earth reasons. My 8 year old son has been onto this for years. He's an avid rock collector. He has so many I've started putting them in glass jars to display. I love when he walks up to me, smiles, and says "I have something for you, i think you're going to like it," and pulls a rock out of his pocket. Those stones are really compelling actually. So smooth, and the blue and white swirls remind me of this "big blue marble" comparison to the earth that used to be on TV when I was a kid. My grandfather always had a "worry stone" in his pocket. It calmed him to rub on it. Isn't it funny how those spontaneous, off-the-cuff rants that should be all means be only half-way true, end up really being spot-on? i don't really think you need to know anything about rocks, i think you just have to like them. :-) it's quite addictive, let me tell youA totally different angle to stones. Normally I only acknowledge them if they are in my shoes. But this kind of theorizing fits the whole choosing to be happy/silver linings crap i have going (not to mention corn). Perhaps I'll now look at the ones in my shoes as opportunities to commune with nature.